Having a healthy, balanced relationship with your dog based on mutual trust, respect and love is only the beginning. It’s also important to share that ideal and ‘pay it forward’ in our lives with dogs and beyond our pets. 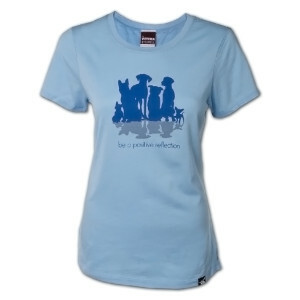 That’s the concept behind this new design we created in collaboration with our friends at Dog is Good as part of our exclusive Victoria Stilwell Collection – Be a Positive Reflection. It’s tough to argue with the idea that we should take our positive relationships with our beloved 4-legged friends and amplify that spirit outward so that everyone can see and benefit from the power of Positive. The Be a Positive Reflection t-shirt is constructed 4.2oz, 100% ring-spun cotton. Cut to be a roomier flattering tee, it is true to women's sizing. I love the message and the fabric is so soft.